My mom’s sewing machine always had issues. Both my parents tell me how much time they spent researching the best machine they could afford, how they bought it used and still spent around 200€ (twenty years ago), so it’s sad that it never worked as well as they expected. It went to the repair shop multiple times and after seeing it for so many years without use I decided to put it to repair myself. In December I went to PFAFF as I saw lots of recommendations in a portuguese facebook group about this shop and I now have a full functioning sewing machine (at least for now!). If you’re curious, I paid about 45€ for the repair and it had two problems: the bobbin and the needle were out of sync and the foot pedal wouldn’t stay up. Now the sewing machine is at my house, even though it’s a little bit hard to store it in my apartment, we don’t have a lot of space for it. 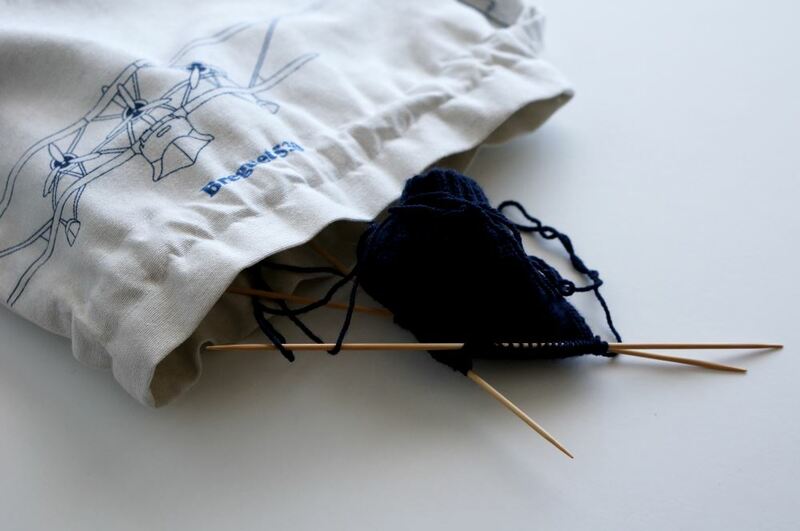 Last weekend I spent some time sewing and following this instructions to create a lined drawstring bag. Including cutting I think I spent about 3 hours doing this, if you’re experienced this should be super easy for you. I struggled particularly with the cutting because I don’t have any fancy tools to figure out if I’m cutting it straight or not. I used a slightly thick fabric that my mom had and I could only add one of the ties, I’d recommend you to be careful when choosing the fabric so this doesn’t happen to you. The bag was meant to be used as a knitting project bag and happy to report it fulfills its duty. It’s currently holding the socks I’m knitting for my brother. I’ll probably make two more of this to practice a little bit more, they’re useful and only have straight lines so good for a beginner like me. I also have a couple of other things that I’m planning to do that seem easy enough, so I’ll definitely share them once they’re finished. I’m curious to find out what do you find easy and useful (useful is super important to me) to sew! Let me know in the comments.